Flight is the main mode of locomotion used by most of the world's bird species. Flight assists birds while feeding, breeding, avoiding predators, and migrating. Aerodynamic drag is the force opposite to the direction of motion, and hence the source of energy loss in flight. The drag force can be separated into two portions, lift-induced drag, which is inherent in the wing (primarily arising from wingtip vortices), and parasitic drag, including skin friction drag from the friction of air and body surfaces and form drag from the bird's frontal area. The streamlining of bird's body and wings reduces these forces. When a bird flaps, as opposed to gliding, its wings continue to develop lift as before, but the lift is rotated forward to provide thrust, which counteracts drag and increases its speed, which has the effect of also increasing lift to counteract its weight, allowing it to maintain height or to climb. Flapping involves two stages: the down-stroke, which provides the majority of the thrust, and the up-stroke, which can also (depending on the bird's wings) provide some thrust. At each up-stroke the wing is slightly folded inwards to reduce the energetic cost of flapping-wing flight. Birds change the angle of attack continuously within a flap, as well as with speed. Lesser flamingos flying in formation. When in gliding flight, the upward aerodynamic force on both birds and gliders is equal to the weight. In gliding flight, no propulsion is used; the energy to counteract the energy loss due to aerodynamic drag is either taken from the potential energy of the bird, resulting in a descending flight, or is replaced by rising air currents ("thermals"), referred to as soaring flight. The bird's forelimbs (the wings) are the key to flight. Each wing has a central vane to hit the wind, composed of three limb bones, the humerus, ulna and radius. The hand, or manus, which ancestrally was composed of five digits, is reduced to three digits (digit II, III and IV or I, II, III depending on the scheme followed), which serves as an anchor for the primaries, one of two groups of flight feathers responsible for the wing's airfoil shape. The other set of flight feathers, behind the carpal joint on the ulna, are called the secondaries. The remaining feathers on the wing are known as coverts, of which there are three sets. The wing sometimes has vestigial claws. In most species these are lost by the time the bird is adult (such as the highly visible ones used for active climbing by hoatzin chicks), but claws are retained into adulthood by the secretarybird, screamers, finfoots, ostriches, several swifts and numerous others, as a local trait, in a few specimens. Albatrosses have locking mechanisms in the wing joints that reduce the strain on the muscles during soaring flight. Female birds exposed to predators during ovulation produce chicks that grow their wings faster than chicks produced by predator-free females. Their wings are also longer. Both adaptations may make them better at avoiding avian predators. The shape of the wing is important in determining the flight capabilities of a bird. Different shapes correspond to different trade-offs between advantages such as speed, low energy use, and maneuverability. Two important parameters are the aspect ratio and wing loading. Aspect ratio is the ratio of wingspan to the mean of its chord (or the square of the wingspan divided by wing area). Wing loading is the ratio of weight to wing area. Most kinds of bird wing can be grouped into four types, with some falling between two of these types. These types of wings are elliptical wings, high speed wings, high aspect ratio wings and soaring wings with slots. Elliptical wings are short and rounded, having a low aspect ratio, allowing for tight maneuvering in confined spaces such as might be found in dense vegetation. As such they are common in forest raptors (such as Accipiter hawks), and many passerines, particularly non-migratory ones (migratory species have longer wings). They are also common in species that use a rapid take off to evade predators, such as pheasants and partridges. High speed wings are short, pointed wings that when combined with a heavy wing loading and rapid wingbeats provide an energetically expensive high speed. This type of flight is used by the bird with the fastest wing speed, the peregrine falcon, as well as by most of the ducks. The same wing shape is used by the auks for a different purpose; auks use their wings to "fly" underwater. The peregrine falcon has the highest recorded dive speed of 242 mph (389 km/h). The fastest straight, powered flight is the spine-tailed swift at 105 mph (170 km/h). High aspect ratio wings, which usually have low wing loading and are far longer than they are wide, are used for slower flight. This may take the form of almost hovering (as used by kestrels, terns and nightjars) or in soaring and gliding flight, particularly the dynamic soaring used by seabirds, which takes advantage of wind speed variation at different altitudes (wind shear) above ocean waves to provide lift. Low speed flight is also important for birds that plunge-dive for fish. These wings are favored by larger species of inland birds, such as eagles, vultures, pelicans, and storks. The slots at the end of the wings, between the primaries, reduce the induced drag and wingtip vortices by "capturing" the energy in air flowing from the lower to upper wing surface at the tips, whilst the shorter size of the wings aids in takeoff (high aspect ratio wings require a long taxi to get airborne). Small birds often fly long distances using a technique in which short bursts of flapping are alternated with intervals in which the wings are folded against the body. This is a flight pattern known as "bounding" or "flap-bounding" flight. When the bird's wings are folded, its trajectory is primarily ballistic, with a small amount of body lift. The flight pattern is believed to decrease the energy required by reducing the aerodynamic drag during the ballistic part of the trajectory, and to increase the efficiency of muscle use. The ruby-throated hummingbird can beat its wings 52 times a second. Several bird species, including one family, use hovering. True hovering by generating lift through flapping alone rather than by passage through the air demands a lot of energy. This confines the ability to smaller birds. The largest bird able to truly hover is the pied kingfisher, although larger birds can hover for short periods of time. 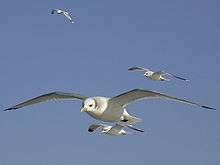 Larger birds that hover for prolonged periods do so by flying into a headwind, allowing them to remain stationary relative to the ground or water. Kestrels, terns and even hawks use this windhovering. Most birds that hover have high aspect ratio wings that are suited to low speed flying. One major exception to this are the hummingbirds, which are the most accomplished hoverers of all the birds. Hummingbird flight is different from other bird flight in that the wing is extended throughout the whole stroke, the stroke being a symmetrical figure of eight, with the wing producing lift on both the up- and down-stroke. Some hummingbirds can beat their wings 52 times a second, though others do so less frequently. A male bufflehead runs atop the water while taking off. Take-off is one of the most energetically demanding aspects of flight, as the bird must generate enough airflow across the wing to create lift. Small birds do this with a simple upward jump. That doesn't work for larger birds, which must take a run up to generate sufficient airflow. Large birds take off by facing into the wind, or, if they can, by perching on a branch or cliff so they can just drop off into the air. Landing is also a problem for large birds with high wing loads. This problem is dealt with in some species by aiming for a point below the intended landing area (such as a nest on a cliff) then pulling up beforehand. If timed correctly, the airspeed once the target is reached is virtually nil. Landing on water is simpler, and the larger waterfowl species prefer to do so whenever possible, landing into wind and using their feet as skids. 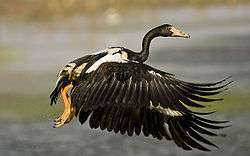 To lose height rapidly prior to landing, some large birds such as geese indulge in a rapid alternating series of sideslips or even briefly turning upside down in a maneuver termed as whiffling. A wide variety of birds fly together in a symmetric V-shaped or a J-shaped coordinated formation, also referred to as an "echelon", especially during long distance flight or migration. This pattern of formation flying is resorted to so as to save energy and improve the aerodynamic efficiency of birds. 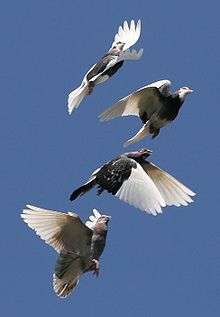 The birds flying at the tips and at the front interchange positions in a timely cyclical fashion to spread flight fatigue equally among the flock members. The wingtips of the leading bird in an echelon create a pair of opposite rotating line vortices. The vortices trailing a bird create an underwash, which creates an induced drag for the bird. At the same time these vortices create an upwash that can aid the flight of following birds. In a 1970 study the authors claimed that each bird in a V formation of 25 members can achieve a reduction of induced drag and as a result increase their range by 71%. Studies of waldrapp ibis show that birds spatially coordinate the phase of wing flapping and show wingtip path coherence when flying in V positions, thus enabling them to maximally utilise the available energy of upwash over the entire flap cycle. In contrast, birds flying in a stream immediately one behind another do not have wingtip coherence in their flight pattern and their flapping is out of phase, as compared to birds flying in V patterns, so as to avoid the detrimental effects of the downwash due to the leading bird's flight. The most obvious adaptation to flight is the wing, but because flight is so energetically demanding birds have evolved several other adaptations to improve efficiency when flying. Birds' bodies are streamlined to help overcome air-resistance. Also, the bird skeleton is hollow to reduce weight, and many unnecessary bones have been lost (such as the bony tail of the early bird Archaeopteryx), along with the toothed jaw of early birds, which has been replaced with a lightweight beak. The skeleton's breastbone has also adapted into a large keel, suitable for the attachment of large, powerful flight muscles. The vanes of each feather have hooklets called barbules that zip the vanes of individual feathers together, giving the feathers the strength needed to hold the airfoil (these are often lost in flightless birds). The barbules maintain the shape and function of the feather. Each feather has a major (greater) side and a minor (lesser) side, meaning that the shaft or rachis does not run down the center of the feather. Rather it runs longitudinally of center with the lesser or minor side to the front and the greater or major side to the rear of the feather. This feather anatomy, during flight and flapping of the wings, causes a rotation of the feather in its follicle. 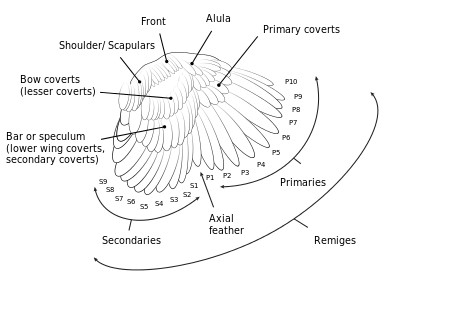 The rotation occurs in the up motion of the wing. The greater side points down, letting air slip through the wing. This essentially breaks the integrity of the wing, allowing for a much easier movement in the up direction. The integrity of the wing is reestablished in the down movement, which allows for part of the lift inherent in bird wings. This function is most important in taking off or achieving lift at very low or slow speeds where the bird is reaching up and grabbing air and pulling itself up. At high speeds the air foil function of the wing provides most of the lift needed to stay in flight. The large amounts of energy required for flight have led to the evolution of a unidirectional pulmonary system to provide the large quantities of oxygen required for their high respiratory rates. This high metabolic rate produces large quantities of radicals in the cells that can damage DNA and lead to tumours. Birds, however, do not suffer from an otherwise expected shortened lifespan as their cells have evolved a more efficient antioxidant system than those found in other animals. Black-legged kittiwakes fly at Cape Hay in the High Arctic. From the trees down, that birds' ancestors first glided down from trees and then acquired other modifications that enabled true powered flight. From the ground up, that birds' ancestors were small, fast predatory dinosaurs in which feathers developed for other reasons and then evolved further to provide first lift and then true powered flight. Wing-assisted incline running (WAIR), a version of "from the ground up" in which birds' wings originated from forelimb modifications that provided downforce, enabling the proto-birds to run up extremely steep slopes such as the trunks of trees. Pouncing proavis, which posits that flight evolved by modification from arboreal ambush tactics. 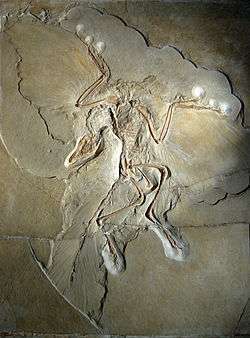 There has also been debate about whether the earliest known bird, Archaeopteryx, could fly. It appears that Archaeopteryx had the brain structures and inner-ear balance sensors that birds use to control their flight. Archaeopteryx also had a wing feather arrangement like that of modern birds and similarly asymmetrical flight feathers on its wings and tail. But Archaeopteryx lacked the shoulder mechanism by which modern birds' wings produce swift, powerful upstrokes; this may mean that it and other early birds were incapable of flapping flight and could only glide. The presence of most fossils in marine sediments in habitats devoid of vegetation has led to the hypothesis that they may have used their wings as aids to run across the water surface in the manner of the basilisk lizards. It is unknown how well Archaeopteryx could fly, or if it could even fly at all. This was the earliest hypothesis, encouraged by the examples of gliding vertebrates such as flying squirrels. It suggests that proto-birds like Archaeopteryx used their claws to clamber up trees and glided off from the tops. Some recent research undermines the "trees down" hypothesis by suggesting that the earliest birds and their immediate ancestors did not climb trees. Modern birds that forage in trees have much more curved toe-claws than those that forage on the ground. The toe-claws of Mesozoic birds and of closely related non-avian theropod dinosaurs are like those of modern ground-foraging birds. Feathers are very common in coelurosaurid dinosaurs (including the early tyrannosauroid Dilong). Modern birds are classified as coelurosaurs by nearly all palaeontologists, though not by a few ornithologists. The original functions of feathers may have included thermal insulation and competitive displays. The most common version of the "from the ground up" hypothesis argues that bird's ancestors were small ground-running predators (rather like roadrunners) that used their forelimbs for balance while pursuing prey and that the forelimbs and feathers later evolved in ways that provided gliding and then powered flight. Another "ground upwards" theory argues the evolution of flight was initially driven by competitive displays and fighting: displays required longer feathers and longer, stronger forelimbs; many modern birds use their wings as weapons, and downward blows have a similar action to that of flapping flight. Many of the Archaeopteryx fossils come from marine sediments and it has been suggested that wings may have helped the birds run over water in the manner of the Jesus Christ lizard (common basilisk). Most recent attacks on the "from the ground up" hypothesis attempt to refute its assumption that birds are modified coelurosaurid dinosaurs. 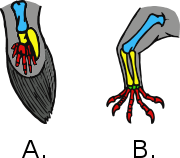 The strongest attacks are based on embryological analyses, which conclude that birds' wings are formed from digits 2, 3 and 4 (corresponding to the index, middle and ring fingers in humans; the first of a bird's 3 digits forms the alula, which they use to avoid stalling on low-speed flight, for example when landing); but the hands of coelurosaurs are formed by digits 1, 2 and 3 (thumb and first 2 fingers in humans). However these embryological analyses were immediately challenged on the embryological grounds that the "hand" often develops differently in clades that have lost some digits in the course of their evolution, and therefore bird's hands do develop from digits 1, 2 and 3. The wing-assisted incline running (WAIR) hypothesis was prompted by observation of young chukar chicks, and proposes that wings developed their aerodynamic functions as a result of the need to run quickly up very steep slopes such as tree trunks, for example to escape from predators. Note that in this scenario birds need downforce to give their feet increased grip. But early birds, including Archaeopteryx, lacked the shoulder mechanism that modern birds' wings use to produce swift, powerful upstrokes. Since the downforce that WAIR requires is generated by upstrokes, it seems that early birds were incapable of WAIR. Birds use flight to obtain prey on the wing, for foraging, to commute to feeding grounds, and to migrate between the seasons. It is also used by some species to display during the breeding season and to reach safe isolated places for nesting. Flight is more energetically expensive in larger birds, and many of the largest species fly by soaring and gliding (without flapping their wings) as much as possible. Many physiological adaptations have evolved that make flight more efficient. Birds that settle on isolated oceanic islands that lack ground-based predators often lose the ability to fly. This illustrates both flight's importance in avoiding predators and its extreme demand for energy. ↑ "Intermittent Flight Studies". Retrieved 2014-03-06. 1 2 Tobalske, B; et al. "The intermittent flight of Zebra Finches: Unfixed gears and body lift". Retrieved 2014-03-06. ↑ Kaplan, Matt (25 March 2011). "Frightened birds grow longer wings". Retrieved 2011-03-27. ↑ Batt, Bruce (1 October 2007). "Why do migratory birds fly in a V-formation?". Scientific American. Retrieved 16 Jan 2014. ↑ H. P. Thien; M. A. Moelyadi; H. Muhammad (2008). "Effects of Leaders Position and Shape on Aerodynamic Performances of V Flight Formation". arXiv:0804.3879 [cs.RO]. ↑ Lissaman, P. B. S.; Shollenberger, Carl A. (22 May 1970). "Formation Flight of Birds". Science. 168 (3934): 1003–1005. Bibcode:1970Sci...168.1003L. doi:10.1126/science.168.3934.1003. Retrieved 16 Jan 2014. ↑ Portugal, Steven J.; Hubel, Tatjana Y.; Fritz, Johannes; Heese, Stefanie; Trobe, Daniela; Voelkl, Bernhard; Hailes, Stephen; Wilson, Alan M. & Usherwood, James R. (16 January 2014). "Upwash exploitation and downwash avoidance by flap phasing in ibis formation flight" (abstract). Nature (505): 399–402. Bibcode:2014Natur.505..399P. doi:10.1038/nature12939. Retrieved 16 Jan 2014. ↑ Brush, A.H. (July 1998). "Taking Wing: Archaeopteryx and the Evolution of Bird Flight". The Auk. 115 (3): 806. doi:10.2307/4089435. Book review that provides a good, non-technical summary of the issues. The book is Shipman, P. (1999). Taking Wing: Archaeopteryx and the Evolution of Bird Flight. Simon & Schuster. ISBN 0-684-84965-8. ↑ Alonso, P.D. ; Milner, A.C.; Ketcham, R.A.; Cokson, M.J & Rowe, T.B. (August 2004). "The avian nature of the brain and inner ear of Archaeopteryx". Nature. 430 (7000): 666–669. Bibcode:2004Natur.430..666A. doi:10.1038/nature02706. PMID 15295597. 1 2 Senter, P. (2006). "Scapular orientation in theropods and basal birds, and the origin of flapping flight" (Automatic PDF download). Acta Palaeontologica Polonica. 51 (2): 305–313. 1 2 Feduccia, A. (1999). The Origin and Evolution of Birds. Yale University Press. ISBN 978-0-300-07861-9. See also Feduccia, A. (February 1995). "Explosive Evolution in Tertiary Birds and Mammals". Science. 267 (5198): 637–638. Bibcode:1995Sci...267..637F. doi:10.1126/science.267.5198.637. PMID 17745839. ↑ Glen, C.L. & Bennett, M.B. (November 2007). "Foraging modes of Mesozoic birds and non-avian theropods" (abstract). Current Biology. 17 (21): R911–2. doi:10.1016/j.cub.2007.09.026. PMID 17983564. ↑ Prum, R. & Brush, A.H. (2002). "The evolutionary origin and diversification of feathers" (PDF). The Quarterly Review of Biology. 77 (3): 261–295. doi:10.1086/341993. PMID 12365352. ↑ Mayr G.; Pohl B.; Peters D.S. (2005). "A well-preserved Archaeopteryx specimen with theropod features". Science. 310 (5753): 1483–1486. Bibcode:2005Sci...310.1483M. doi:10.1126/science.1120331. PMID 16322455. ↑ Burgers, P. & L. M. Chiappe (1999). "The wing of Archaeopteryx as a primary thrust generator". Nature. 399 (399): 60–62. Bibcode:1999Natur.399...60B. doi:10.1038/19967. ↑ Cowen, R. History of Life. Blackwell Science. ISBN 0-7266-0287-6. ↑ Videler, J.J. (2005). Avian Flight. Oxford: Oxford University Press. ISBN 0-19-856603-4. ↑ Burke, A.C. & Feduccia, A. (1997). "Developmental Patterns and the Identification of Homologies in the Avian Hand" (abstract). Science. 278 (5338): 666. Bibcode:1997Sci...278..666B. doi:10.1126/science.278.5338.666. Summarized at "Embryo Studies Show Dinosaurs Could Not Have Given Rise To Modern Birds". ScienceDaily. October 1997. ↑ Chatterjee, S. (April 1998). "Counting the Fingers of Birds and Dinosaurs". Science. 280 (5362): 355. Bibcode:1998Sci...280..355C. doi:10.1126/science.280.5362.355a. ↑ Vargas, A.O. ; Fallon, J.F. (October 2004). "Birds have dinosaur wings: The molecular evidence" (abstract). Journal of Experimental Zoology Part B: Molecular and Developmental Evolution. 304B (1): 86–90. doi:10.1002/jez.b.21023. PMID 15515040. ↑ Pennisi, E. (January 2005). "Bird Wings Really Are Like Dinosaurs' Hands" (PDF). Science. 307 (5707): 194–195. doi:10.1126/science.307.5707.194b. PMID 15653478. ↑ Dial, K.P. (2003). "Wing-Assisted Incline Running and the Evolution of Flight" (abstract). Science. 299 (5605): 402–404. Bibcode:2003Sci...299..402D. doi:10.1126/science.1078237. PMID 12532020. Summarized in Morelle, Rebecca (24 January 2008). "Secrets of bird flight revealed". Scientists believe they could be a step closer to solving the mystery of how the first birds took to the air. BBC News. Retrieved 25 January 2008. Wikimedia Commons has media related to Bird flight.